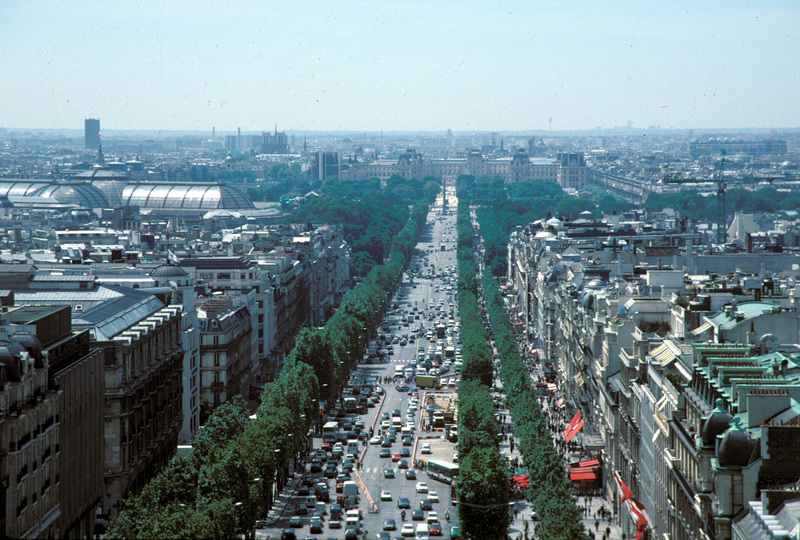 Paris' grand boulevard combines tremendous amounts of traffic, public transit, and tourism, while maintaining a distinct sense of Parisian urbanity at the pedestrian level. 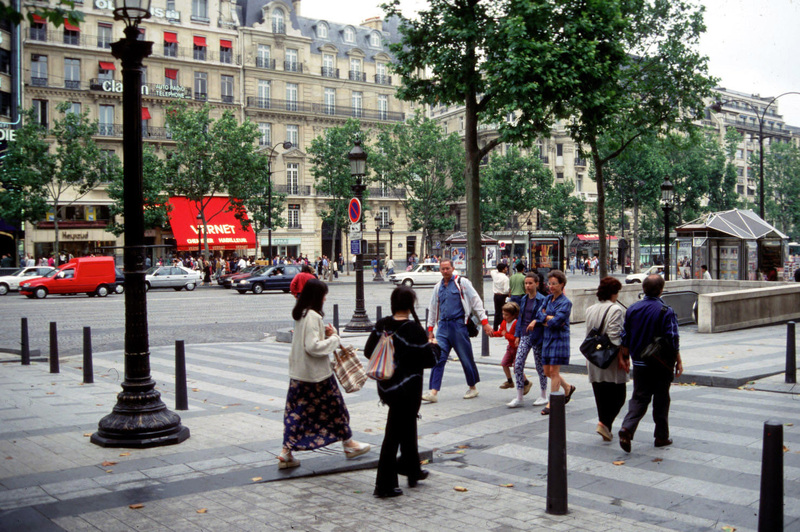 Stretching from the Place de la Concorde to the Place Charles de Gaulle, the Avenue des Champs-Elysees is a wide, heavily trafficked boulevard lined with cafes, theaters, and boutiques. 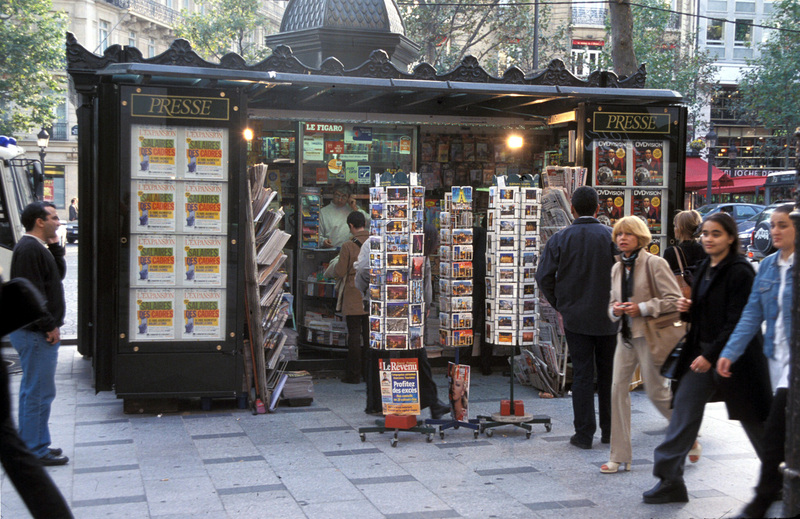 The 2.6-mile promenade, punctuated by the Arc de Triomphe and the Obilisque, was the traditional site for the aristocracy to parade its wealth; even today, the action is on the sidewalk, and the most successful businesses are those that relate most closely to the action. 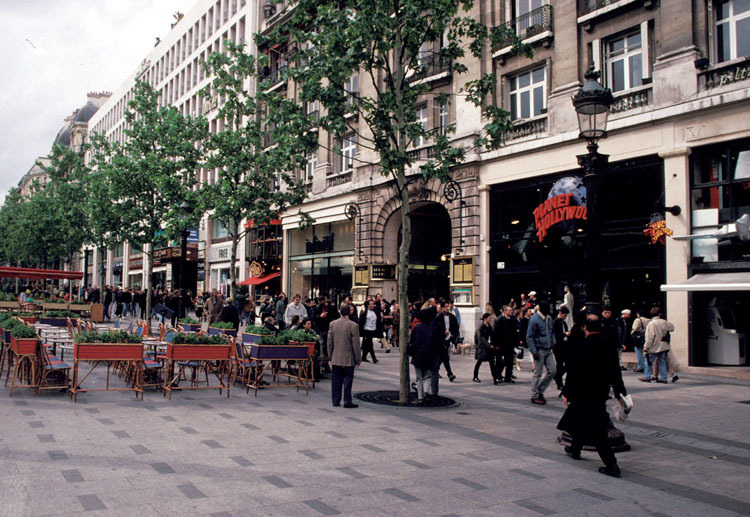 Both the businesses and the pedestrians are celebrated by their placement on the most celebrated promenade in the world. 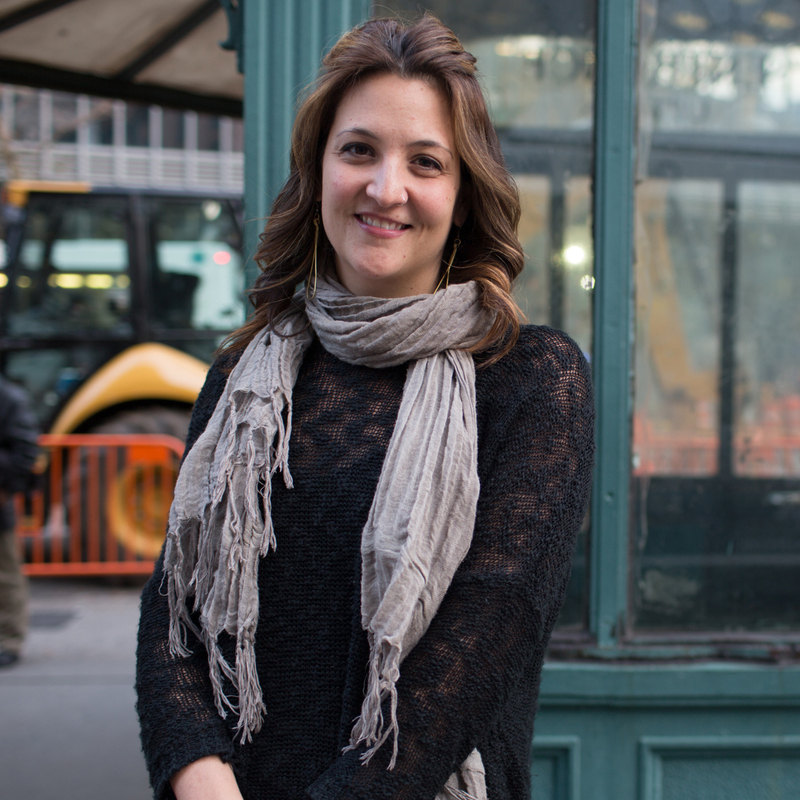 Extra-wide sidewalks provide adequate space for cafes and vending. Continuity of trees and lighting scales down the expanse of the sidewalk. The alley of trees along the curb provides pedestrians with a buffer from the automobile traffic. There are few benches on the Champs Elysees but many outdoor restaurants and cafes have chairs facing the sidewalk. Outdoor seating enhanced by plantings, coverings, shade and color. Sidewalk amenities include colorful banners, cast-iron kiosks with displays, ornate street lamps, and interesting sidewalk patterns. Most people walk on the north, sunny side, where there are more cafes, theaters, chain stores and boutiques. 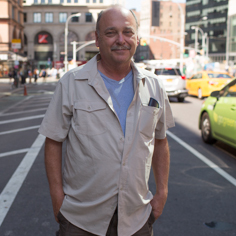 Fewer stroll on the south, where there is less sun and more banks and luxury restaurants. Activity does not decline after dark; the street is well-lit and takes on a new ambiance of nightlife. The prominence of the avenue gradually developed through the 17th and 18th centuries under a variety of kings and architects. 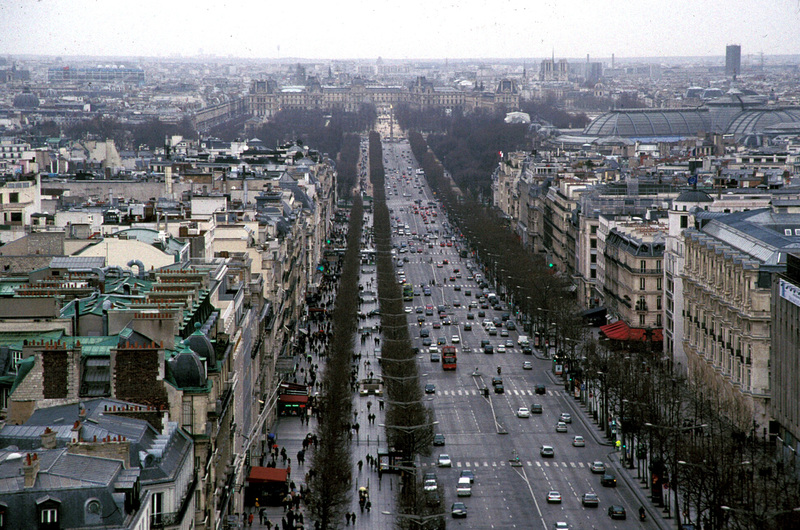 It was conceived in 1610 to give King Louis XIV an impressive view from the Tuileries garden. First completed in 1774, in 1828 Napolean added footpaths, fountains, and gas lighting, and this boulevard, as well as many others, took on a monumental, processionary quality. A 1994 restoration helped the boulevard regain some of its charm as a promenade. 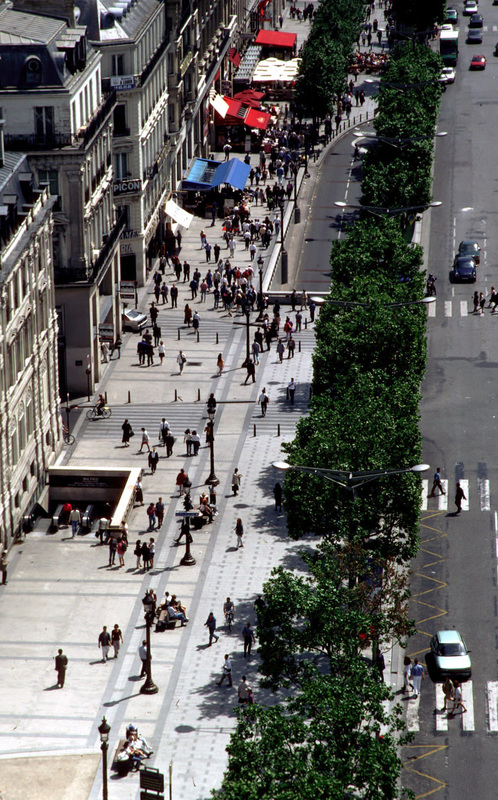 New street furniture was added, cars were diverted to side roads, the sidewalks were widened and improved, bollards were installed, parking problems were appeased by an underground garage, and the street's general appearance was improved with granite paving and double rows of trees. 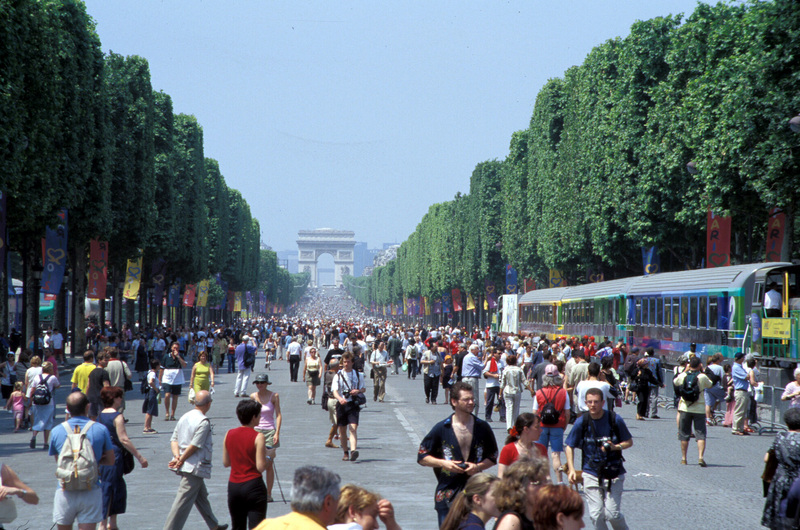 It is illegal to stop or park a car on the Champs Elysees but there is underground parking available (13 frs/hour, $2.50/hour).